I am an american born hockey player who, at age 16, went "up to Canada" to play hockey, to better my chances of achieving something that i was obsessed with as a kid: playing hockey in the NHL. After spending two years at St, Micheal's in Toronto, I played for 2 seasons for the London Knights in the OHL. In 1976, after the 2 seasons playing for the London Knights, i was drafted by the Detroit Red Wings in the fifth round of the NHL amateur draft and spent 7 seasons in the minors, although during that time, I did get called up to play a few NHL games with Detroit and Montreal. ( During my first NHL game, at age 20, playing for the Detroit Red Wings, I scored the game tieing goal with two minutes to play in the game! I was "pumped!"). 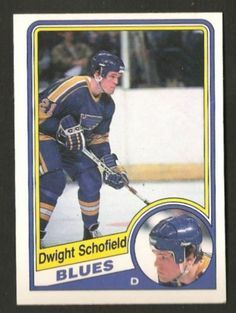 After 7 years in the minors and being known as a talented offensive defenseman, I finally established myself in the "The Big Leagues", and over the next 5 seasons I played for St. Louis, Washington, Pittsburgh, and Winnipeg. During my time as a "regular NHL'er, I was known more for my ability to "fight", than for being a talented player,( as was the case previously,) ... and I was asked to play the role of the "tough guy"/"enforcer". After the 87-88 season , after 5 years of playing a role that I didn't enjoy, I considered myself "washed up" and decided that I should retire from hockey and did so. Upon retiring, I settled in St. Louis, Missouri, where I have resided through the present. Since retiring , I have been the owner of 3 businesses and I am presently employed in the construction industry. I am single with no children. I enjoy working out and keeping myself in shape.